Coal Creek to Mesquite Divide has been our favorite hike since moving to Driggs over 13 years ago. It starts at the base of Teton Pass, on the Driggs side, and heads east towards Taylor Mountain and the Tetons. 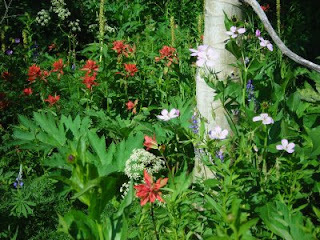 There's water, wildflowers, aspen & pine trees, views, shade, snow banks, 2,000 feet of climbing, and an incomparable view of the Tetons at the top. We've taken many friends and family members along over the years, and that final view always brings an audible "wow." 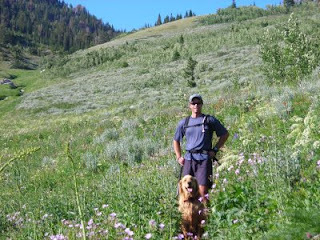 No one enjoyed this hike more than our former dog Targhee. He first did the hike at 9 months old back in '96, chasing sticks and bounding up and down hills with ease. He cleared it for the final time in September of '06, plodding steadily behind us. A dog's compressed lifespan is vivid reminder of our own advancing years, no doubt. Targhee was doing great at 11 years old, then his health hit a sudden tailspin and he was gone in March '07. Ironically, he passed away on the exact day that Bridger was born. Targhee was the gold standard of dogs, that once-in-a-lifetime companion. Respectful and obedient, yet also playful and enthusiastic. He was always game for adventure, but his defining trait was an unmatched ability to just chill and reflect. His eyes were humanlike, his wordless communication absolutely clear. Friends called him "the wonder dog," especially after he led us out of the hills on a particularly pitch-black night, one of many great Targhee stories. Most of our Targhee photos are old prints, but this rare digital shot reflects his singular presence. We wanted to remember Targhee in the perfect place, and Mesquite Divide was the clear choice. It took us 16 months to gather the courage, but we finally made the pilgrimage to honor him last week. The hike up Coal Creek was somber, but peaceful. Memories flooded back, especially of the friends and family who shared this hike with Targhee in years past, and even Bridger was more subdued than usual. 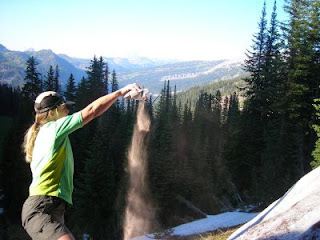 We took turns sprinkling Targhee's ashes, then just held each other and wept. Crazy how much it still hurts, but we don't have kids, and a piece of us definitely passed away with him. We haven't been completely the same since, and if you knew Targhee you understand. So, as the wildflowers bloom in the high country each summer, and the elk bugle each fall, and the snow piles high each winter, the Tetons will be keeping Targhee company overseeing it all. The BIG T lives on, part of that circle of life, and we'll never forget him. We're even seeing more of him in Bridger each day now, thank goodness. So, Targhee, our buddy and soulmate, R.I.P. We sincerely hope to see you again. Reading this entry brought chills to my body and tears to my eyes... What a tender, emotional experience for you both. RIP Targhee... hopefully we will see you again! What a beautiful tribute to Targhee. Peace be with you all! Thanks for sharing your pictures and memories. 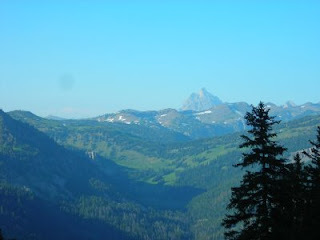 I have many fond memories of Targhee that I won't soon forget. I have so many great memories of adventures with Targhee and I have tears in my eyes as I write this. Targhee was a huge reason that Michelle and I decided to get a dog and then when we got Bechler, Targhee taught him to lie down in creeks when it's hot out. I think about Targhee all of the time and probably will forever. Annie, Rachel, Alicia and Dave: sincere thanks to you all for the thoughtful comments. This has been another go-round of powerful emotion, but has also confirmed what a great soulmate Targhee was. As one friend concluded, "the Big T lives on." Targhee sounds like a wonderful companion. This was a touching entry. 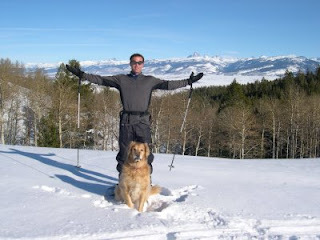 i found your site looking for hikes around Driggs, and read about Targhee. Wow - very powerful. I, too, lost an animal companion recently (although I realize you wrote about Targhee in 2008) and really empathize. Animals are our soulmates, indeed. Rick - No dog or person could want a more meaningful tribute. It's incredible what our dogs do for us and what we do for them and it's quite amazing how many of us have had that singularly unique soul mate in our lives, that combination of special dog, time and place. It takes years before their absence becomes less important than the recognition of our good fortune in having shared their lives and in being so enriched by that experience. My son will be out your way hiking and I'm sure he'll be catching the positive energy of your Big T.